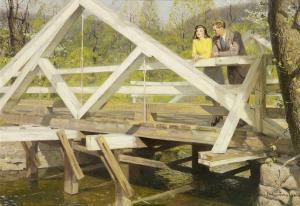 Find artworks, auction results, sale prices and pictures of Tom Lovell at auctions worldwide. Tom Lovell (1909-1997) George Washington signed 'Tom / Lovell' (lower right) mixed media on board 16 x 24in Executed circa 1950s. Footnotes Provenance Country Store Gallery, Austin, Texas. Acquired by the late owner from the above, 1983. Upon acquiring the present work, the artist wrote to L.D. 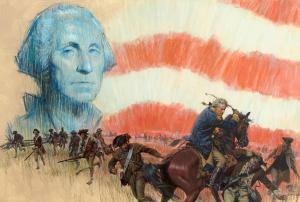 Brinkman detailing his intentions in conveying the monumental figure that was George Washington in this unique, commissioned portrait illustration: "This was done as an illustration for True, the men's magazine, back in the 50s. It was a biographical article showing that George Washington was not always the calm, cool 'Father of his Country' but a real man, sometimes shaken by anger and passion. The action in this lower part shows him at the Battle of Long Island, trying to stem the retreat of his troops, who were routed by the British - all this seen as a foil to the familiar portrait done in cool colors at the top of the painting. 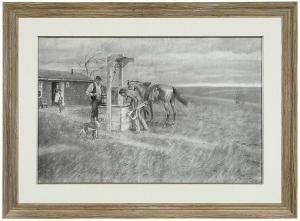 "1 1 Tom Lovell, unpublished letter. 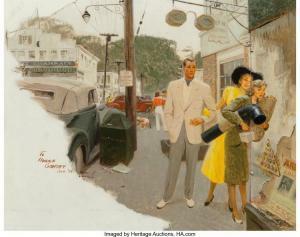 Sale 2480 Lot 94 TOM LOVELL. "'I believe in magic too,' she said. There was a faraway look in her eyes." Illustration for "Do You Remember?" by Peter Stirling Cardozo, published in Woman's Home Companion, September 1947. Oil on canvas. 635x914 mm; 25x36 inches. Signed and dated 47 in lower right image. Framed, with a plaque containing Lovell's given title "The Bridge." Accompanied by a copy of the magazine. 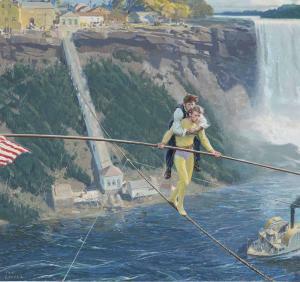 Tom Lovell (1909-1997) Blondin Crossing Niagara signed 'Tom/Lovell' (lower left) oil on masonite 23¼ x 24⅝ in. (59 x 62.5 cm.) Provenance Private collection. Acquired by the present owner circa 2003. Literature "Blondin Crossing Niagara," True Magazine, 1953, illustrated. Please note this lot is the property of a private individual.